The weather is beginning to really heat up in the Sanford area, ramping up Florida residents for another hot and humid summer brimming with triple-digit days. To avoid being left in a puddle of your own sweat from a malfunctioning HVAC system before the heat settles in, taking a few steps to ensure it’s in a good working condition will create a cool and comfortable indoor climate all summer long. While we can’t control much in life — including what mother nature throws. At Air Nation, we can control the indoor climate with our many HVAC services including HVAC repair and HVAC installation. In today’s post, we’ll touch on the ways you can get your HVAC system ready for summer. HVAC terms are pretty basic, but to get a full understanding here is a guide to help you! Filter – A filter is a device used to remove foreign air particles from your HVAC system; they are usually located throughout your home. Air Conditioning – A part of your HVAC system that cools your home through control of humidity and temperature with the removal of moisture by condensation. Compressor – This is the device changes low-pressure refrigerant to high-pressure refrigerant. Condenser – A component that helps modulate heat being changed from a gas to a liquid. Evaporator – The piece that absorbs heat from the inside air as a result of liquid refrigerant being changed into gas. 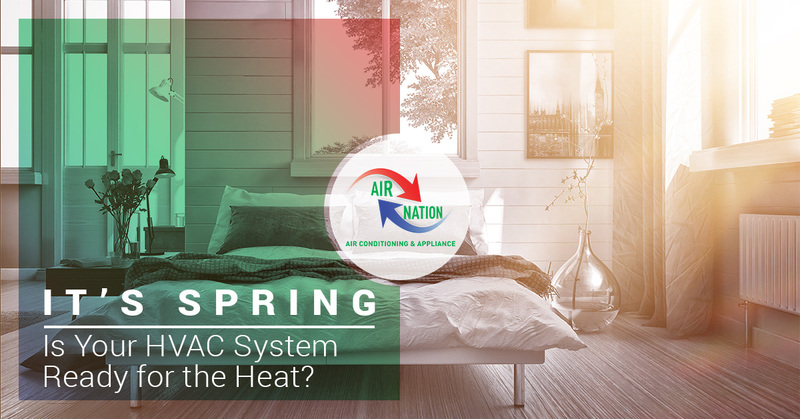 Springtime is the ideal time to get your AC working and check for any issues before the sizzling Florida temperatures really begin to set in. Check your filters – There is varying advice on replacing your air filters from every month to twice per year, but if you’re checking them regularly, change them when they look like they need it. Clean filters are crucial for good air quality and you don’t want your crisp, cool air to be compromised with dirty and allergenic air particles, and clean ones also increase efficiency for better energy usage. If you are diligent about having your HVAC routinely serviced by professionals, they can change the filter while they are there. Clean the outdoor part of your HVAC – After the seasonal changes of fall and winter, there may be debris around the base of the unit. Sweeping and clearing it helps reduce any fire hazards and keeps it running in tip-top condition all summer long. You can also check and make sure all the parts are tight and that there is no liquid leaking. Keep an eye on your energy bills – If you’ve been running your AC, pay attention to how often it’s running and if your monthly energy bill in significantly increasing. Both of these things indicate that your system isn’t running or operating efficiently. Have your AC immediately serviced for any malfunctions or leaks. Clear your AC compressor – The AC compressor is a part of your HVAC unit located outside and looks like a large slotted fan, so it’s prone to collecting dirt and debris. It can accumulate leaves and small branches so using a shop vacuum to clear everything is most effective, followed by wiping it down. Check the indoor AC system – Do you have an outdated thermostat? It may be a good time to upgrade it for a programmable one that can save you money on your monthly energy bill. For optimum airflow make sure any items that blocks vents such as curtains, electronics, and furniture are out of the way. Schedule routine AC maintenance – This is the best, possibly most time-efficient way to address everything related to your AC system. When you hire a professional company to come in, they can tackle all of the issues listed above in one visit, and schedule out any needed AC repairs! If you’re anticipating the Sanford summer heat, get your AC running properly today by checking your air filters, paying attention to the energy usage, cleaning the outdoor part of your AC unit including the compressor, and checking the indoor components to the AC like vents and thermostat. For expert HVAC services that include AC installation and AC repair in the Sanford area, contact us at Air Nation today!